They pride themselves on “thinking differently”, providing the best possible service for their customers, exceeding their expectations and providing fantastic entertainment. 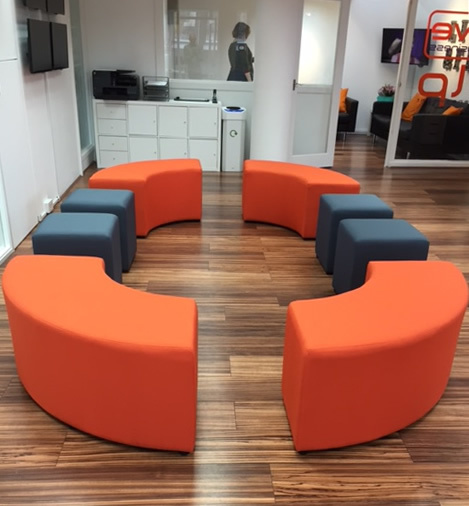 Office Reality was approached by Live Business when they spotted that we were able to supply breakout seating that would be suitable for their new office space. They were looking for colours that would match their company logo. Whilst wanting to reflect the service that they provide, a contrasting colour would be ideal. 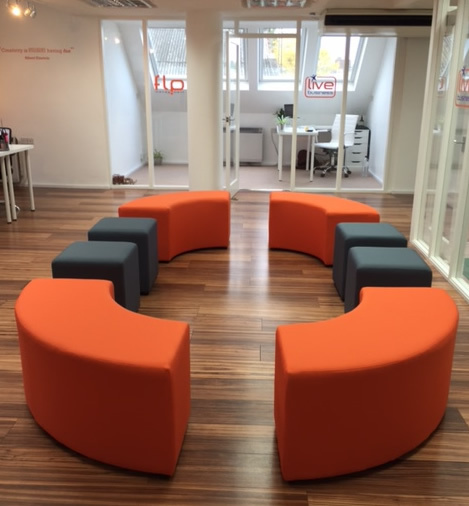 Having found modular seating that would be ideal for moving around, two contrasting colours were chosen that would be suitable for the office colours: orange and slate grey. The colours fuse wonderfully with the white office furniture already present, brightly reflecting the personality of the office space.